Two (Song) : The more expensive the golf ball the more water-magnetic it is! Buy them by the bag outside of the golf course! Will you find at some courses men swimming in the lakes and rivers, poised waiting for your ball! You can sometimes buy it back for a small fee! Three (Sam): Topping an iron is the most painful torture known to man. Four (See): If you ask the caddie “Did the ball go into the water?” and she replies “50/50” or “Haa sib haa sib” then it is 100% in the water! Six (Hok): A solid slice is a thing of awesome muscle and magnificence. Seven (Jed): No matter how bad your last shot was, the worst is yet to come. 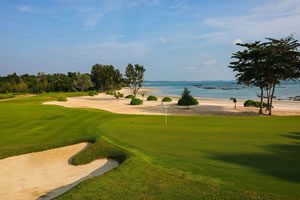 But don’t worry you can stop for a beer every three holes in Thailand! 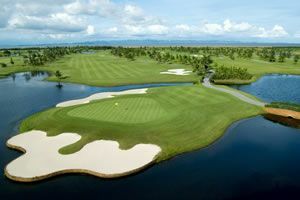 Eight (Paed): Palm trees in Thailand eat golf balls. Nine (Gao): Golf carts always run out of gas at the remotest point from the clubhouse. Fear not the Marshalls patrol the courses here and a new one will be dispatched to you! Ten (Sib): Depending on your tip to the caddie… the last three holes of a round will automatically correct your score to what you really think it should be!